Noise control doors explained. 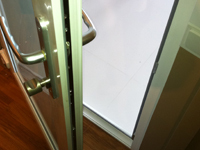 There are different types of doors that are used to treat noise problems. There are also different types of construction materials used to treat different noise issues or scenarios. 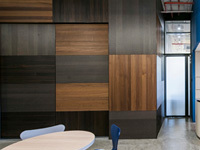 We use this term to describe doors that improve the quality of sound within its enviroment. 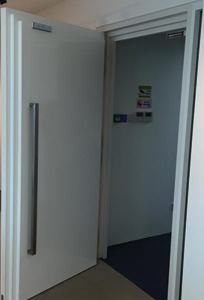 These door typically are the very thick timber doors that you see in studios they help to balance out the sound and at the same time are able to reduce noise escaping through them. The rear of the door will either be padded or empty, the timber finish is important in the end result of the returning standing wave. These doors have one purpose only to stop as much noise as possible, they are never made in timber as they require extensive locking hardware and seals in order to get an airtight fit into the frame. They can be used for commercial usage when using a double door option and home usage when using single. Most of our doors sold are to designers and other soundproofing door companies for their clients and projects. 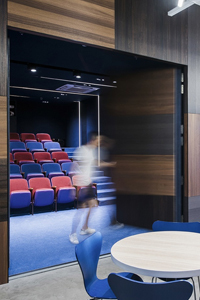 We have supplied doors for Yamaha, Changi Prison, Swee Lee Music Schools, Madison Achedmy of Music, Eight Note Music Schools and many more through 3rd parties. The noiseblock NBG Door features a transparent core that offers an STC of 55 dB reduction of noise. Its frame is made using due bridge technology and internal multi locking system uses german engineering. 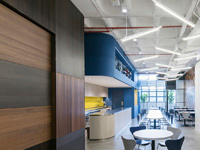 The door by far for the noise reduction and cost is the best door on the worldwide market. 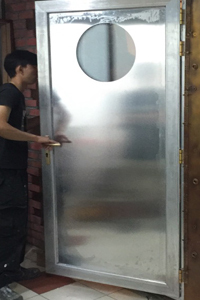 The NoiseBlock 'Swee Lee' Soundproof Door Model was specifically designed for use at Swee Lee music centers. It features a NoiseBlock Glass Laminated Quad Glazed Gas Injection core. The frame design uses our Duo Bridge Iso Decoupler technolgy surrounded by multi locking hardware and triple seals. When the door is closed and one person stands at one side and another stand oppersite you can not hear both people speaking. The NoiseBlock STC 65 Soundproof Door noise reduction speaks for itself. With the combination of MG Hardware and Netro Nelson 3 Teir Design brings performance that sets new standards in our industry. The Mark 2 of our high performance range of doors features some very cool NYTC tech that right now is so reverlutionary that we can't even tell you whats in this door. The door weight is around 100kg and is a total thickness of 80mm. 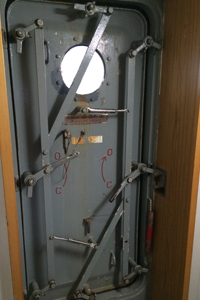 The Mark 1 design is a solid Iron door with a visco elastic core it is 100% air tight sealed and come from the techology used in submarine vessles. The noise reduction of this bad boy is nothing to joke about. 120dB reduction down to 45dB. It features a tripple laminated porthole window that is 55mm thick. The door weight is around 120kg and is a total thickness of 70mm. This door requires 2 month waiting time for fabrication. 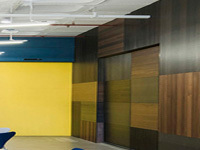 The NoiseBlock Soundproofing Timber Door series made for Honest Bee is a 3m x 4m 2 leaf door. It offers excellent sound reduction for a door of this size. The features all of the usaual soundproofing features that you have come to exspect from NoiseBlock inventor and designer Netaro Nelson. Different levels of reducton can be acheived depending on finishes and fixtures on the base door design. 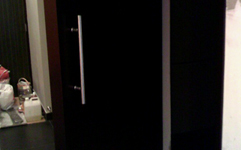 Mr Wongs Doors, was designed for home use and specifically for use with home cinemas and music. 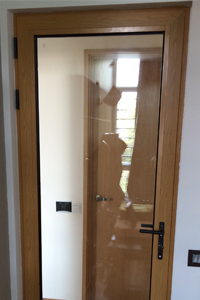 The door features our NoiseBlock Glass Quad Glazed core and then a multi locking german hardware system in the frame. The build performance and cost have been taken into consideration to make a door that everyone can afford. This timber door uses a 2 tier core that was invested by Netaro Nelson. There are a few copies on market that are poor imitations of the authentic NoiseBlock product. The door is aproximatly 6 inches thick and has a 3 point locking system. It is designed to stop large amounts of base escaping perfect for music rooms and home theatres. For a 100% reduction you will need to install an aditional NBG door for the seals. Typical the noise reduction is from 90-98dB to 55dB. The NoiseBlock Crazy door is a double system door for profesional use it can reduce allmost 100% of noise and to date is not beaten by any other company on the market in its range. Of course if you want to buy a door for over 10k then there are some better but no one wants to spend this type of money. The crazy door uses one NBG Door followed by a second PX7 Door built into the same continus frame. Disspite what many of the other acoustic companies in Singapore would have you belive door seals and drop seals are not going to make a normal door into a soundproof door. It may help slighty with noise traveling through the gaps in the door but if you are using this on a normal door you are wasting your time and money. 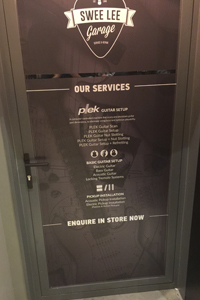 Using sound reduction permeter seals or drop seals on sound reduction doors or soundproof doors can and will make a difference to the overall acoustic performance of the door. As the door allready is reducing large amounts of the noise the little bits of noise left are very obvious and any problems that might ocure from sealing will make the difference between night and day. Raven Seal are the best manufaturer of sound reduction drop seals & Perimerter Seals on the market. If you are looking to improve the results of our doors these would be the peferct acsessoriy to our soundproofng doors.